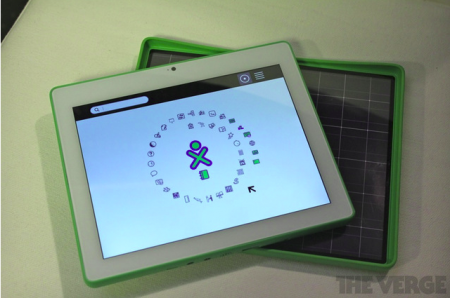 Joanna Stern, who has reviewed many OLPC models in the past, takes an in-depth look at the XO-3 prototype at CES, in a detailed review for The Verge. In addition to an excellent writeup, she interviews Ed McNierney while exploring the laptop in person, in what looks like Max Headroom’s office. They talk about everything from hardware and power to software and deployment. They also took the best set of photos of the XO-3 and solar-cover to date! 1) Why has OLPC ended the “Give One-Buy One” program? When the program resume? Resumption of the program would seem to result in a huge win-win situation with no adverse consequences. Are other factors at play? If so, can you disclose these factors? 2) Where is there a list & description of application software which runs on on the OLPC computer? adults (even in previously rich countries such as the US)? Previous Previous post: Stories from Eshibinga Primary I: Why Sugar?